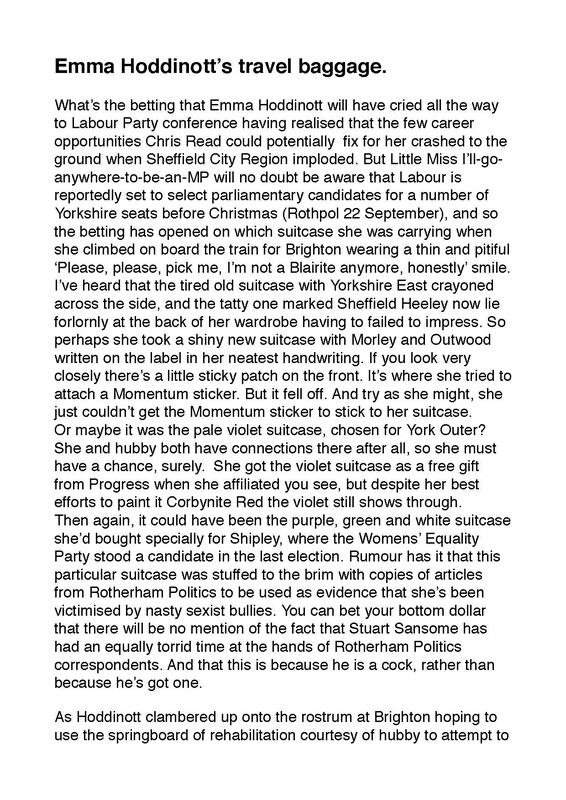 This entry was posted in Uncategorized and tagged Chris Read, Dominic Beck, Emma Hoddinott, ISTC/Community caucus, John Doyle, Labour Chicanery, Labour Party, Maggie Godfrey, Mahroof Hussain, Momentum, Paul Lakin, Progress, RMBC, Rotherham Metropolitan Borough Council, SCR, Stuart Sansome by Rik. Bookmark the permalink. Im not fooled, always knew she was a careerist blairite from day one. All smiles in front of camera then when it come to talking with swinton members she would look at you like sh!t on the shoe. Maybe a few emails and some electronic performance review forms for residents in Eastwood would stop it? Maybe thats where its going wrong…….. they dont have email. Karen Hanson’s resignation letter? Why is Karen leaving / going? yeah kaz is going , bullied by the queen of waste ? Allegedly. Noone has got to the nub of the issue. In the interest of an open and transparent selection process it is the duty of public spirited individuals to share facts about shortlisted prospective Labour MP candidates with the local party and media, this way individuals who may attempt to whitewash their CV will be prevented from giving the Tory candidate political ammunition to attack the Labour campaign. Better still, individuals with a shaky well hidden past should not apply. I cant see her swinging a selection process in Rotherham. Not a cat in hells chance. There was plenty of free surplus whitewash going after the latest whitewash reports. Rumour in greasebrough is that she and rmbc are gonna store it in the local res. Maybe like the white sea or dead sea? Aah that’s where she’s been. Wondered why the leader came to work today with his coat inside out. 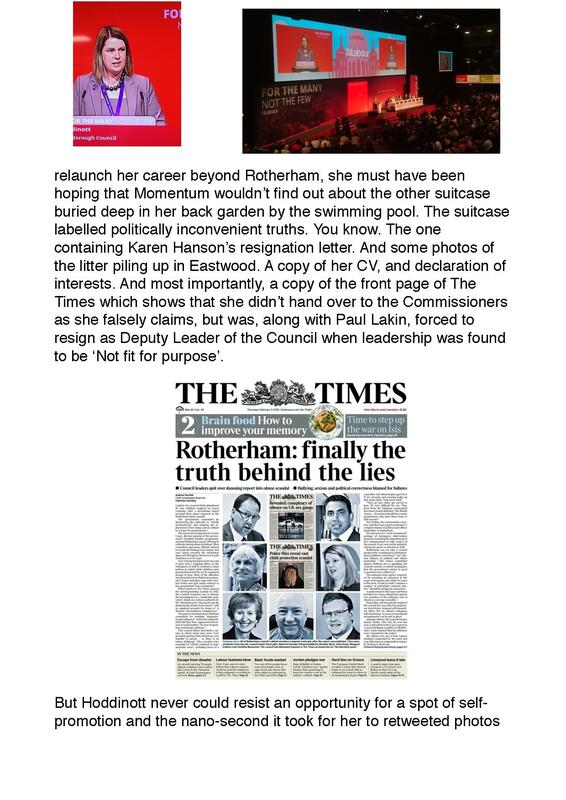 In the piece above from her LinkedIn CV, Emma Hoddinott says she handed over to the Commissioners in Rotherham. This is simply not true she was the deputy leader who had to resign from the ‘not fit for purpose council’, referred to in this piece from Ch4 and John Snow. Watch the link and see Eric Pickles brand her ‘to quote Ch4’ as dysfunctional. She should not member of the cabinet in Rotherham today and she should never be an MP. Too right and this needs showing wherever she tries to plant her sodding cooperative banner. Do you think there will be a massive cover up in the council if Hoddinott was found to be behaving innapropriately with council officers? already happened- read the article you berk, do you think there is any danger of hoddinott going down to the Labour party conference with any baggage from good old Rotherham?